1. Jackson Hole: Top central bankers are gathering in Wyoming for the Jackson Hole economic symposium. The theme of this year's three-day event is "Fostering a Dynamic Global Economy." Investors monitor the event closely because central bankers have been known to announce major policy decisions at the forum. ECB president Mario Draghi is one of this year's headline speakers, and traders will be looking for clues about the central bank's plans to wind down its stimulus program. 2. Debt ceiling: Investors are starting to wake up to the risks of the U.S. breaching its debt ceiling. The U.S. Treasury is approaching the date when it won't have enough cash and revenue on hand to pay all bills in full and on time. Currently the legal borrowing limit is set at $19.81 trillion. Since mid-March, when the most recent debt ceiling suspension ended, Treasury has been using special accounting measures to allow the government to continue borrowing as needed. It could run out of runway as soon as October. "Investors would remain highly sensitive to any new headlines around the U.S. government shut down due to the debt ceiling hitting its boundary," said Naeem Aslam, chief market analyst at Think Markets UK. 3. Earnings: A range of companies are reporting earnings on Thursday ahead of the open, including Abercrombie & Fitch (ANF), Dollar Tree (DLTR), Hormel Foods (HRL), J.M. Smucker (SJM), Sears Holdings (SHLD), Staples (SPLS) and Tiffany & Co (TIF). GameStop (GME) will release earnings after the close. 4. Meh markets: Stock markets are going nowhere fast. 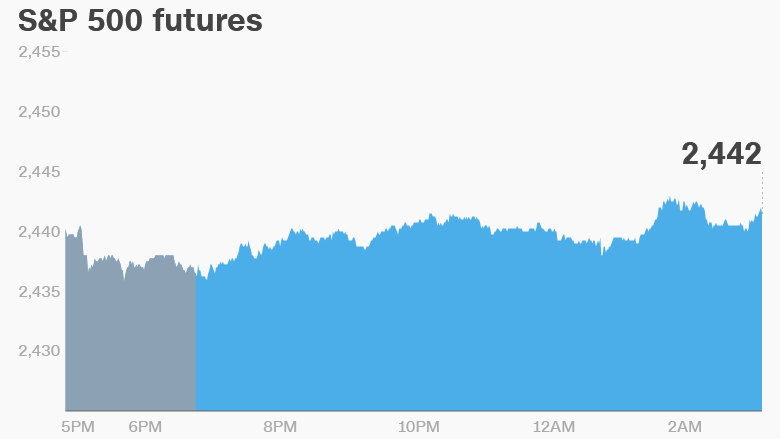 U.S. stock futures were holding steady on Thursday. European market moves were muted in early trading. Asian markets closed out the day with mixed results. The Dow Jones industrial average, S&P 500 and Nasdaq all dropped on Thursday by 0.3% to 0.4%. They're still trading close to record highs.